In 1935 a souvenir pack of playing cards to celebrate the King's 65th birthday was commissioned from the British firm of De La Rue. The packs are very elaborate with full gold edges and come in a red padded box; the intricate designs depicting people from the middle ages contain elements of Danish heraldry. Two years later, in 1937, the cards were reissued to celebrate the Silver Jubilee of the King's reign as a double pack in a similar box. The back design of the 65th birthday anniversary pack shows the King in official regalia while the silver jubilee packs have portraits of the King on one and Queen Alexandrine on the other. 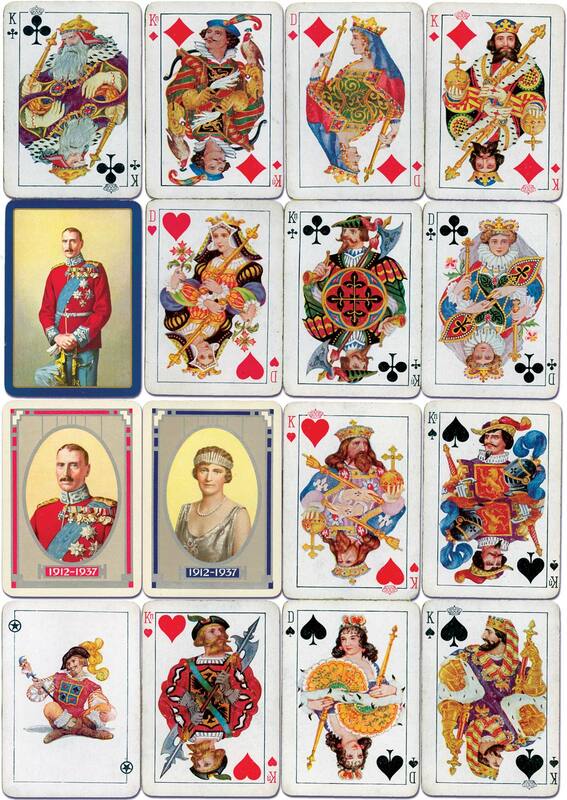 Above: De La Rue playing cards commemorating King Christian X and Queen Alexandrine. The packs were also issued with a plain chequered back as Warburg’s L’Hombre-Kort. Alf Cooke was also manufacturing playing cards for Denmark, Iceland and Romania around this time, when German manufacturer Dondorf had closed.